Haruki Murakami's first book Hear the Wind Sing, published in 1979 (Alfred Birnbaum's English translation in 1987) exhibits many of his later trademarks, though on a much smaller scale, clocking in at 130 pages and fitting nicely in a coat pocket.The author's time spent in America comes across not only in direct references to American culture (mostly music) but in a peculiar universal placelessness during the story, broken only by the rare mention of Tokyo or a place in and around the city. This novel (or novella) sets up Murakami's atypical narrative techniques (jumping around in time, mainly) that would pervade later books to a greater extent. The most startling revelation - for somebody who's read later Murakami books before his first - is the immediate presence of wells. 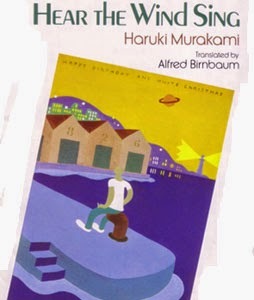 In The Wind-Up Bird Chronicle, a backyard well plays a prominent role in the main character's story; here a brief description of a sci-fi book by a fictional author called The Wells of Mars is present for no clear reason than perhaps to entice the reader to expect the unexpected, something Murakami has accomplished ever since.